Simultaneous switching off some parts of the world that are far away from the camera helps to increase the performance. In the Menu Bar, choose Create -> Optimization -> Switcher and add it to the world. Add all the nodes that should be switched on and off as children to the Switcher node: in the World Hierarchy, drag the nodes to the World Switcher node. 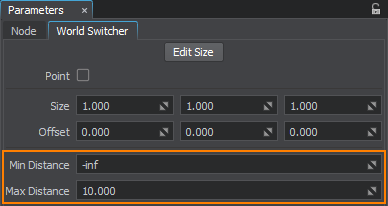 In the World Switcher tab of the Parameters window, specify the switching distances. The distance is calculated from the closest face of the switcher's bounding box. You can use the center point for calculations by enabling the Point option. If you specify the distance that is large enough (for example, several hundred meters), the nodes will disappear unnoticeably for a user.